Venture further, stay longer, embrace the wilderness. Our hikes and camping tours are intended for those looking to go out either off trail or on trails/routes that most tourist do not venture on. Some unpromoted trails around Valdez are best done with a guide, as the occasional tourist has needed search and rescue to save them. These hikes venture further and can perfectly accommodate overnight and extended camping. We also have camping tours for families with younger children who might want to camp remotely without needing to cover as much distance. Please exercise caution describing how intense a tour you're wanting, when signing younger children up. What many outside of Alaska consider tough and roughing it can very well be our starting point of easy/beginner. Last thing we want is for everyone to have a miserable time. There are no facilities available along these tours. Be prepared to pack what you need, and do what you need to out in the wilderness. If you are wanting to camp between Mid May - September be prepared, it doesn't get dark. Winter camping will cost more as more gear is needed. 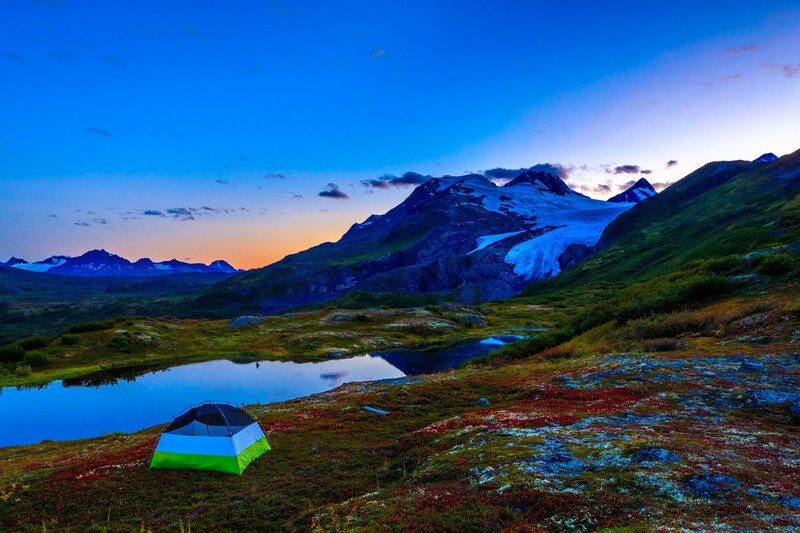 Camping around Valdez offers some of the most pristine views for a real Alaskan experience. Hiking up in the Alpine above Valdez on a guided tour. Hiking up to an unnamed glacier outside of Valdez. Guided hike to an alpine lake near Valdez. Roasting marshmellows while camping near Valdez in the alpine. Guided hiking tours that make you feel like you have your own private glacier. One of our favorite late season alpine locations for our camping tours.